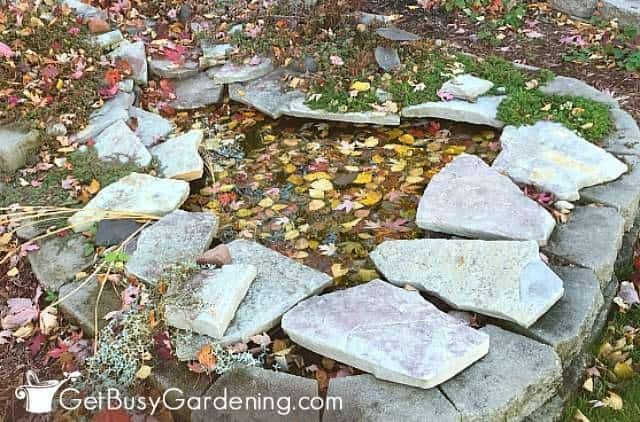 Winterizing your garden pond is a must if you live in a cold climate like I do! 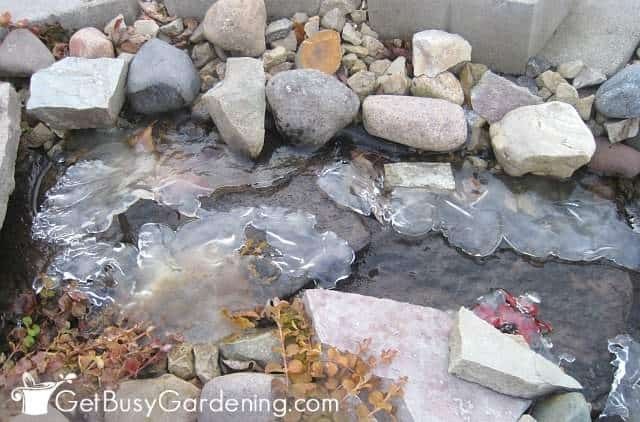 In this post, I will show you exactly how to winterize pond fish, plants, pumps and waterfalls. Plus, I will give you the steps that I take to prepare my pond for winter. I have two small garden ponds on my property, both of them have hardy plants and goldfish living in them. I overwinter both the plants and the fish in the ponds, which is much easier than overwintering them in the house. But don’t worry, it sounds much harder than it is (and you don’t have to remove hardy fish and plants!). Below are steps to wintering a backyard garden pond. Should I Drain My Pond In Winter? The short answer is no. There’s no reason to drain the water, and more than likely it will fill up with rain and snow during the winter anyway. So, as long as you take the proper steps below for winterizing your pond, there’s no reason to drain the water in the fall. In this section, I will give you the steps I take for wintering my pond. 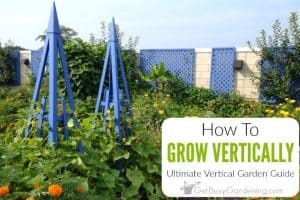 Then, in the sections below, I will talk in more detail about how to winterize pond plants, pumps and fish, and also give you tips for winter pond care too. Step 1: Clean the pond – Decomposing organic material, like fallen leaves, releases toxic gases that can build up in the water and kill overwintering pond fish. So it’s important to remove as much organic material from the pond as you can before winterizing it. To make garden pond maintenance easier in the fall, cover it with pond netting to help prevent leaves and other debris from falling in. Once the leaves are done falling, use a pond skimmer net to remove any that got through the netting. Learn how to clean your pond step-by-step. 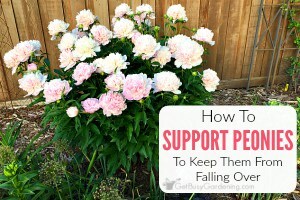 Step 2: Prune pond plants – Pull the pond plants out of the water, and prune them back to remove all the foliage down to the base of the plant. Just like with leaves, decomposing pond plant material can cause toxic gases to build up in the water, which is very dangerous for the fish. Step 3: Add cold water bacteria – Cold water beneficial bacteria helps to break down the fish waste and debris to keep the pond water cleaner and clearer during the winter months. This helps to reduce the chances of toxic gas building up in the water. 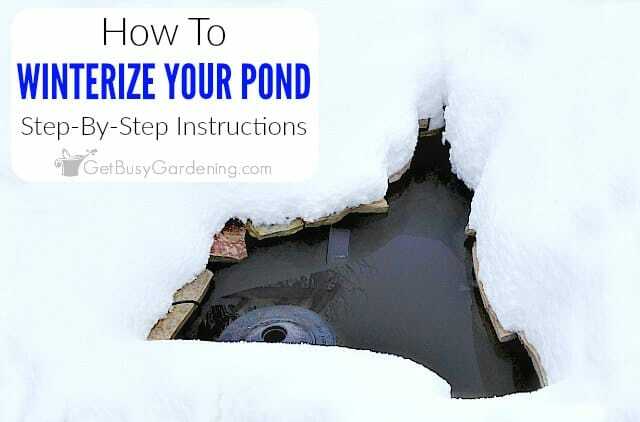 Step 4: Turn off pump – The next step I take for winterize my garden pond is to turn off the pump, and clean the pond filter. I also remove all the parts that are sticking out above the water surface, including the waterfall tubing and the fountain attachments. That way they won’t get damaged when the water freezes in the winter. Step 5: Put the plants and pump back in – Once I get most of the debris out of the pond and everything cleaned, I put the plants and the pump on the bottom in the deepest part of the pond. 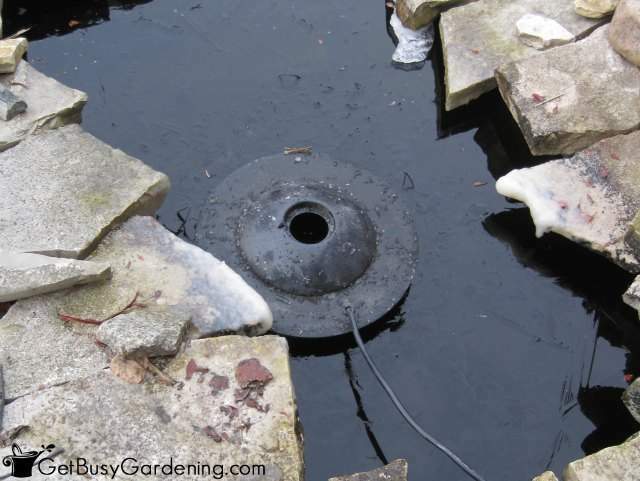 Step 6: Add fish pond heater – The last pond winterizing step that I take is to add my floating pond de-icer. If you’re overwintering fish in your pond, then it’s very important to keep a hole open in the ice during the winter. Oh, and if this is your first year having a pond, then you could get a pond winterizing kit like this one to help make it even easier! Like I mentioned above, I leave the pump in the bottom of my pond through the winter. Since the water won’t be freezing to the bottom of my pond, it won’t harm the pump. If you prefer, you can remove the pump from your pond and overwinter it in a basement, garage or shed. I definitely recommend removing the pump if you don’t plan to prevent the water from freezing over. Otherwise, if the water freezes completely, it could cause severe damage, or even destroy the pump. If you live somewhere with very cold winters like I do, then it’s best to turn your pond pump off before the water starts to freeze. If you plan to leave the pump in the water all winter, then you can leave it running longer. Just be sure to keep a close eye on it once ice starts forming on top of the pond. Otherwise the water can start to run over the top of the ice, and out of the pond. An you definitely don’t want to accidentally drain your pond! If you live in a warm or mild climate, then you can leave your pump running all winter long, or use a pond bubbler for winter. Running water will prevent a pond from freezing over in mild climates, and provide winter pond aeration. Again, keep an eye on the water level if there are any cold spells to be sure the water isn’t being diverted out of the pond because of ice build up. Hardy plants, like water lilies, will survive in a frozen fish pond through the winter. So you don’t need to worry about removing them. Just cut back the foliage and then put them into the deepest part of the pond. Tropical plants however won’t survive the winter in the pond, so they should be removed and discarded, or overwintered indoors. If you’re wondering what to do with pond fish in winter… well, that depends on the type of fish you have. The fish in my pond are goldfish, and they can survive the winter in the pond as long as the water doesn’t freeze over completely. Koi are also pond fish that can survive winter, as long as the water doesn’t freeze completely. Tropical fish however should be overwintered indoors. If you plan to overwinter fish in your backyard fish pond, then you must keep the water from freezing over. Keeping an open area will allow the toxic gases to escape, and oxygen to enter the water to keep the fish alive through the winter. Keeping a hole in the ice will also prevent the pond from freezing to the bottom. If the water freezes to the bottom, it could kill both the plants and the fish (and probably the pump too). Moving water will keep the pond from freezing over during the winter in mild climates, so you can just leave your pump running. But if you’re in a colder climate like I am here in Minnesota, you will need some kind of a pond heater for winter (also called fish pond de-icers) to keep a hole open in the ice. Sometimes during extreme cold spells, my goldfish ponds will freeze over even with my pond water heater. That’s ok since it usually only lasts a few days and the hole will open up again. If you don’t have fish in your pond, then you don’t have to worry about keeping the water from freezing over. 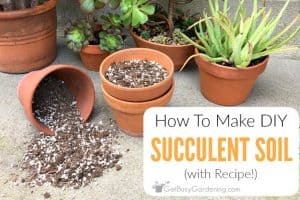 Hardy plants should survive just fine. But, if you don’t plan to put a heater in there, you should remove the pond pump and filter box. Otherwise if the pond freezes to the bottom, it could destroy your pump. If you live somewhere warm you can leave the waterfall running all winter. However, if water freezes on the waterfall it can divert the flow of the water, and quickly drain the pond. So, if you have freezing temps at all, then I recommend turning off the waterfall during the winter. Don’t feed your fish during the winter. Fish don’t digest food very well when it’s cold, and feeding them could end up killing them. Feeding pond fish in winter could also cause harmful gases to build up in the water as the food decomposes. Don’t worry, the fish hibernate during the winter and don’t need food anyway. Snow adds a layer of insulation over the pond heater, and helps to keep the hole open. It also helps the water stay warmer than it would if there was no snow. 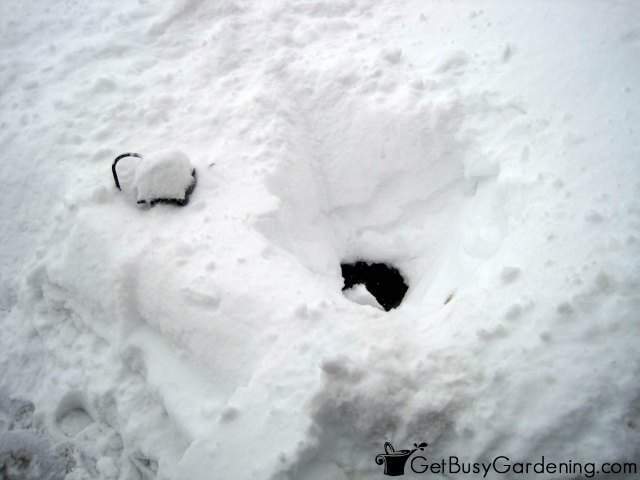 So don’t worry about removing the snow on top of your pond, just be sure the hole isn’t buried for too long. 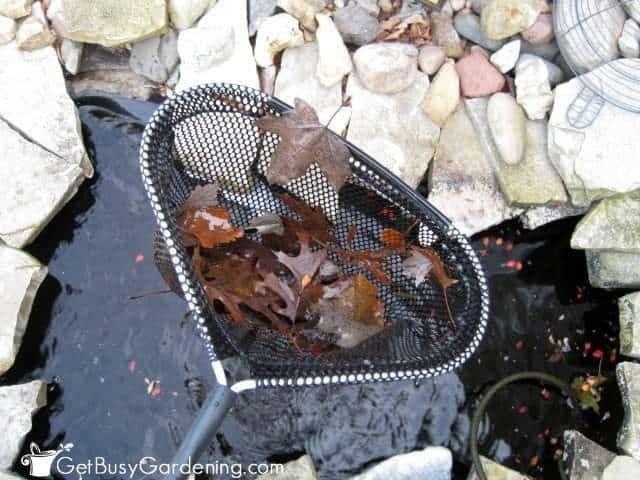 In this post, I showed you how I prepare my pond for winter, and gave you details about how to winterize pond plants, fish, pumps and waterfalls. Winterizing a pond isn’t difficult, but it’s important in order to avoid damage to your equipment, and keep your fish and plants alive through the winter. Up next, learn how to keep pond water clear naturally. Share your pond winterizing tips, or add some of the steps you take to winterize pond fish, pumps, plants and waterfalls in the comments section below. I do all of the same steps as you, except Icover my pond with a net and place an air stone bubbler in my pond instead of the heater. Twice I lost all of my koi due to the heaters, so switched over to the bubblers and all has been fine for the last 15 years. When I lived in Colorado, we could keep the falls on all year which was so nice – but here in CT, it all gets closed up. 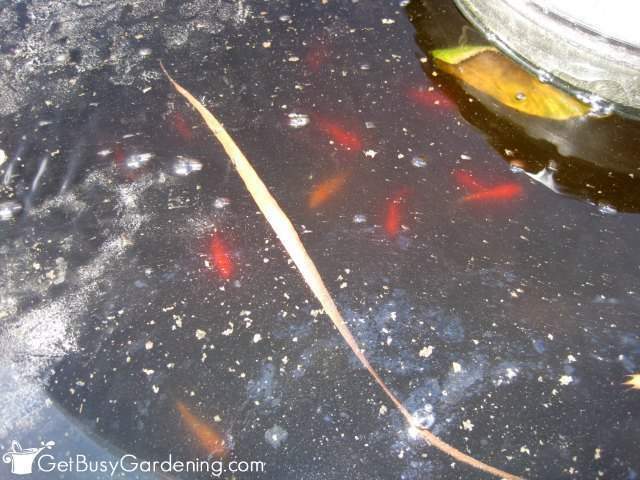 Interesting… how did your koi die from the pond heater? 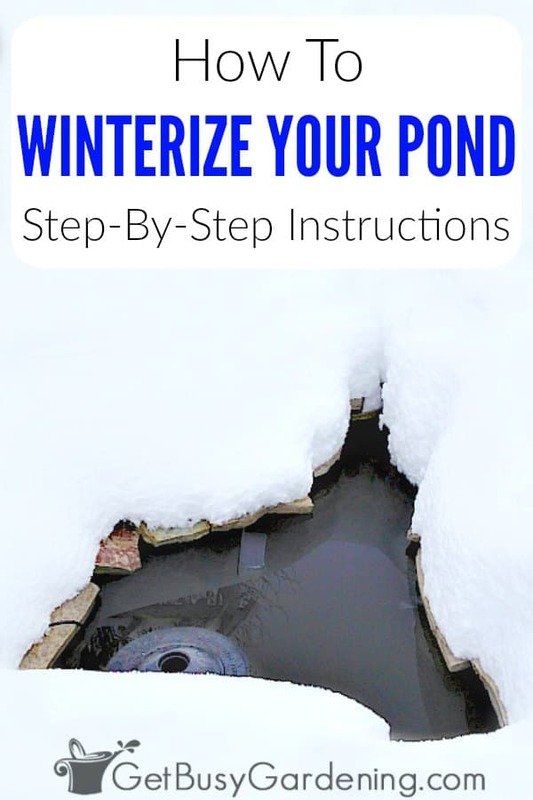 These are great tips for winterizing my pond.. definitely sharing this! I have a small 50 gallon sheep tank that I sunk into the ground this summer. I’ve always had to take my fish in in the winter (3 shuebunkin) but am considering leaving them out this winter. It’s not very deep, maybe a foot, but with it being in the ground I’m hoping will help keep the water from freezing all the way through? Depending on where you live, you may need to add a stock tank heater in order to keep the fish alive. If you live in a climate that’s cold enough where the top of the water will freeze over for more than a couple of weeks at a time, then you’ll definitely need to get a stock tank heater to keep the water open so that air can circulate and the fish won’t die. Here in MN, a one foot deep tank like that would definitely freeze to the bottom without a heater, even if it’s sunk into the ground. I also have two rubbermade ponds on the south side of my house that I lay a pane of glass partially over them and they stay partly thawed all winter unless it’s way below 0 deg. Cool. Thanks for sharing your method of keeping your ponds from freezing over! No. The goldfish will hibernate over the winter and don’t need to be fed. However, if you’re just putting your pond in now, then I would wait until spring to add the goldfish. No reason to try overwintering fish in a brand new pond.